New York Jets defensive back Josh Bush (32) returns his interception against the Miami Dolphins during the second half Sunday. MIAMI GARDENS, Fla. (AP) — The handshakes and backslaps exchanged in the Miami Dolphins’ locker room late Sunday afternoon were gestures of consolation, not celebration, before players quietly slipped out the back door at the end of another disappointing season. Miami was eliminated from the scramble for the AFC’s final wild-card berth by the New York Jets, who thrived in the role of spoilers against their archrivals and won 20-7. The Dolphins blew an early lead to complete a December collapse that will keep them out of the playoffs for a fifth straight year. "It’s definitely going to take a little while to get over this one," quarterback Ryan Tannehill said. 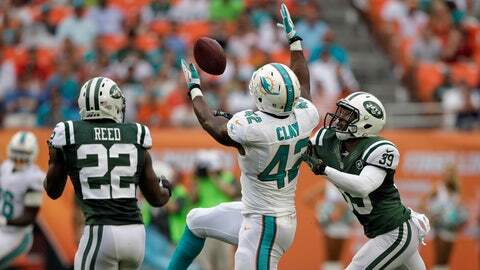 Christina De Nicola offers up her key takeaways and observations from the Dolphins' season-ending loss to the Jets. New York’s Geno Smith led three long scoring drives, ran for a touchdown and threw for 190 yards, while two interceptions by rookie Dee Milliner and one by 35-year-old Ed Reed prevented a Miami comeback. The Dolphins (8-8) squandered a shot at their first postseason berth since 2008 by losing the final two games to non-playoff teams, including a shutout defeat at last-place Buffalo. It was a dismal end to a roller-coaster season that included a four-game losing streak, a bullying scandal that drew national scrutiny, and a December surge that briefly left the Dolphins in control of their playoff destiny — but turned out to be a tease. "Our record is 8-8, and that’s the definition of average," cornerback Brent Grimes said. "We felt like we could be a much better than average team, so we’re disappointed. We messed up in the last two games. We’ve just got to live with that." The Dolphins were outscored 39-7 in those final two games. Now owner Stephen Ross must decide whether to shake up a regime led by second-year coach Joe Philbin and sixth-year general manager Jeff Ireland. The Jets (8-8) celebrated as though they’re playoff-bound but will sit out the postseason for the third year in a row. After the game, owner Woody Johnson announced that coach Rex Ryan would return for a sixth season in 2014. Ryan, whose future had been in question, said Johnson gave him the news before the game. When players were told afterward, they cheered in the locker room. "I’ll say this — I love being the head coach of the New York Jets, plain and simple," Ryan said. "You put everything you’ve got into it. I never wanted to go out this way. We’ve missed the playoffs three straight years, and that bothers me, no question." The Jets made sure they were joined on the postseason sideline by Miami. The only points of the season’s final two weeks for the Dolphins put them ahead 7-0 in the second quarter, but the Jets rallied by mounting touchdown drives of 71 and 80 yards on their final possessions of the first half. When Smith scored on a 7-yard, third-down keeper up the middle with 3 seconds left for a 14-7 lead at halftime, an excited Ryan ran on the field to celebrate with his players. Fans were booing in the first half and streaming for the exits in the final minutes. Smith drove the Jets 63 yards to set up a field goal that gave them a 17-7 cushion with 4:18 left, and on the next play Reed grabbed a deflected pass for his 64th career interception to all but seal the victory. Milliner stopped a Miami threat in the third quarter with a diving interception of Tannehill one play after Mike Wallace dropped a potential touchdown pass that would have tied the game. The Jets played like a team with nothing to lose, which they were, and eager to spoil Miami’s season. They kept the Dolphins off balance with swarming defense and imaginative play-calling, including 294-pound defensive lineman Sheldon Richardson’s 1-yard plunge for his second rushing touchdown this season. 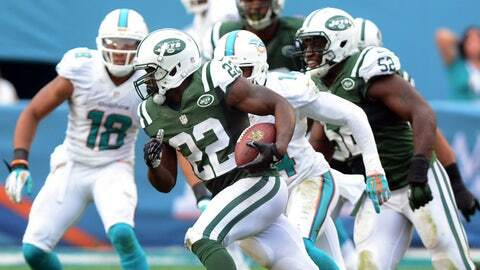 Running back Bilal Powell threw a 30-yard completion to set up the Jets’ field goal. Dolphins receiver Brian Hartline left the game in the first quarter with a left knee injury, while Wallace and Tannehill found it difficult to click all day. Tannehill overthrew an open Wallace deep, and Wallace slipped and fell on Milliner’s first interception. They did combine for a 5-yard touchdown to cap an 89-yard drive. But the Dolphins’ running game sputtered, as usual, and Tannehill finished with a woeful passer rating of 42.1. "It can’t get worse than this," Wallace said. "We let them win. We let them dominate the game. We knew what we had on the line, and we didn’t come up with the plays we needed." Notes: Hartline limped out of the game after a 25-yard reception that put him over the 1,000-yard mark for the second year in a row. … Jets reserve CB Kyle Wilson left in the first half with a knee injury and didn’t return. … Before the game, former LB-DE Kim Bokamper, WR O.J. McDuffie, RB Mercury Morris and G Keith Sims were inducted into the Dolphins’ Walk of Fame.